You may not need to research international law on an everyday basis in your law practice, but when it comes up you will appreciate a logical starting point. That is where International Law Legal Research (Carolina Press) comes in. This is a “concise yet comprehensive” tool meant to be accessible for beginners and more experienced researchers alike, with each type of search tool and search strategy covered in detail with explanations to provide background comprehension. This book gives you an idea of how non-concise the area of international law is, and lets you chart your research course with as few obstacles as possible. Read more about this book here. If you think you might be interested, this book is available in the Law Library. 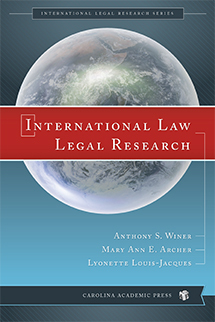 Mary Ann E. Archer, retired Associate Director of the Warren E. Burger Law Library at William Mitchell College of Law, is co-author of this book.